Today I had the opportunity to hear former Olympian speed skater, Bonnie Blair, speak. I joined my husband on his business trip this week as his “+1”. She spoke at one of my husband’s meetings. Although her speech was written for the corporate world, it only took a few minutes to listen to her speak before I was digging in my purse looking for a pen and paper to take notes. Her advice could easily be applied to the teaching world, too. As you can imagine, the theme for Bonnie’s speech centered around goal setting. Summer vacation is the perfect time for teachers to set goals for the new school year. This is the time to take stock in what worked and what did not work last year. How are you going to achieve your goals? The Olympics isn’t every 4 years. It’s everyday! Athletes are preparing everyday so they will be ready for the Olympic games. This is much like school. Teaching and learning happens everyday which is our students’ preparation for their Olympics (the standardized test) at the end of the year. You need a plan to reach your goal. The first thing to think about is the dedication part of Bonnie’s plan. Most school years are 180 days, but the Olympics (standardized test) isn’t given the last week of school. You may only have 140-160 days of instruction before you give the big test. If that is the case for you and you are on the Olympic plan, you will want each of those days to be “Olympic quality practice” days. Think about how an Olympic athlete practices his/her sport! It is very focused and structured. There is a plan in place so he/she will achieve the goal. In an ideal world, schools would plan field trips and other extra activities like that after the “Olympics”. Olympic athletes have a team of helpers: coaches, trainers, corporate sponsors, parents, families, friends, team mates, physical therapist, team doctors, nutritionist, and more. I sometimes think classroom teachers get into this island mentality. When we close our classroom door, it is us with our students when really we are actually a state within a country. We need to take the Olympic approach and reach out to all the different “team members” for advice and support for our students. Many times advice and support can be done informally. Many librarian, reading specialist, math specialist, and counselors have experience teaching either special education or regular education. Not only do they have experience to draw upon, many of these colleagues also teach your students. They are a great resource! Attitude plays a big part in an athletes’ success. Everyone has good days and bad days. Bonnie said there were times when she had good seasons and bad seasons. Teachers can easily relate to this! We have good school years and challenging school years. During those challenging times, we need to take Bonnie’s advice and look for the positive and focus on what we can control. These are just a few of the tips Bonnie gave. I hope the tips help you when you begin making new goals for next year. 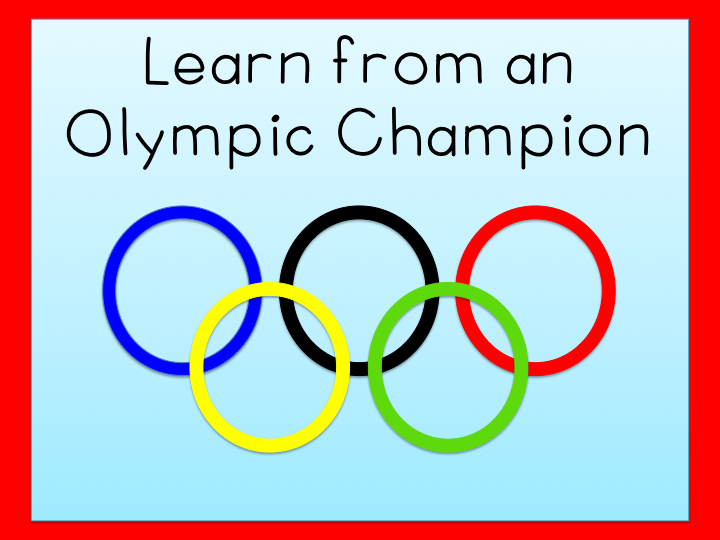 Looking for lessons about the Olympics? I made some Olympic themed Morning Messages that are differentiated. I wrote a post that gives test prep tips and has a FREEBIE that would be perfect for your Olympic Lessons. Click HERE to read the post and get your freebie. I appreciate you sharing some important lessons and reminders for us teachers. These are important reminders! Great and very thoughtful post!